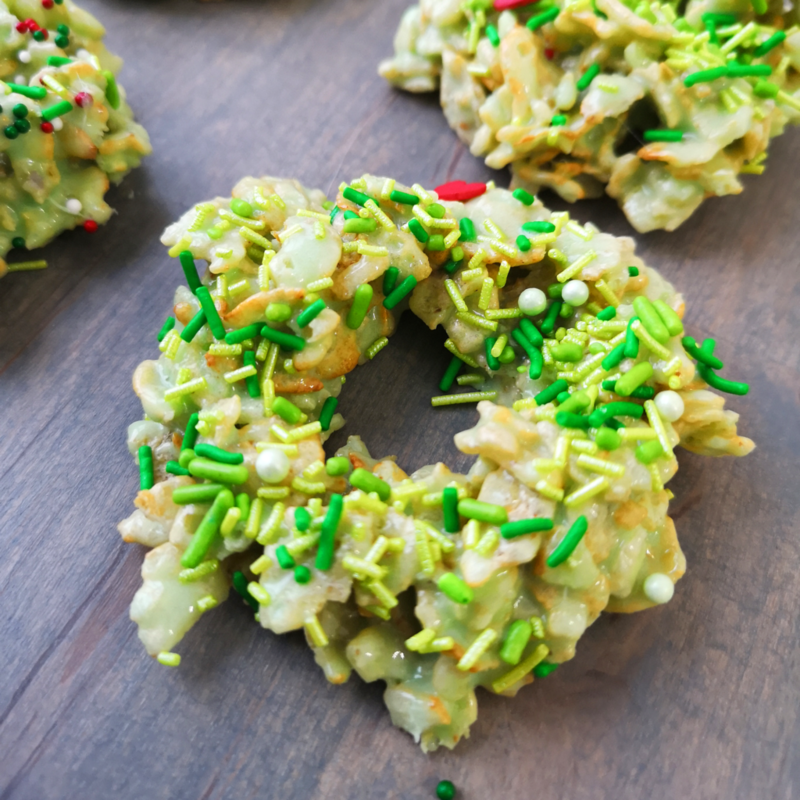 Christmas wreath cookies are, hands down, my absolute favorite cookie. In fact, I rarely make them because by the time they are all made, I’ve literally eaten half the cookies. Then the half that did make it, are generally eaten by the next day. I am fully aware that they are glorified rice crispie treats, in a different form, but it doesn’t stop my love of them. I actually don’t make them very often as I just can’t seem to give them away… mostly due to the fact I’ve eaten them. I decided to make a couple batches this year as I had gone a bit overboard on my marshmallows purchases for the caramel marshmallows. I had so many marshmallows left over, that making wreath cookies was pretty much destiny. Although the recipe is very simple, there are tricks to making them. You want everything ready to go as soon as the marshmallow mix is poured over the cereal. Have a couple of cookie sheets covered in parchment paper and have your decorations or sprinkles ready. A trick to not having gooey marshmallow coating everything in the kitchen is to have a small bowl of ice water right beside the cookie tray. Use a 1/4 cup measuring cup, take a scoop, dip a finger into the ice water and use it to help the mix out of the measuring cup. Once the scoop is on the parchment paper, redip a finger in the cold water and make a hole in the center (aka. the wreath shape). Keep the other hand goo and water-free and use it to sprinkle the jimmies or put the cookie decorations on. You’ll want to scoop fast before the mixture sets up. To keep it a bit more manageable, bring about an inch’s worth of water to a boil in a pot, remove from the heat and set on a kitchen towel or a trivet and set the bowl of crunchy heaven on the pot. Melt the butter in a medium-sized sauce pot. Add the marshmallows and melt, stirring frequently. Once smooth, remove from the heat, add the food coloring until desired shade of green. Pour over the cereal and mix quickly, until the cereal is all coated. Form in wreath shapes on parchment paper. Pop into freezer to complete setting. Store in a tupperware container lined with parchment paper, putting a sheet between the layers of cookies.